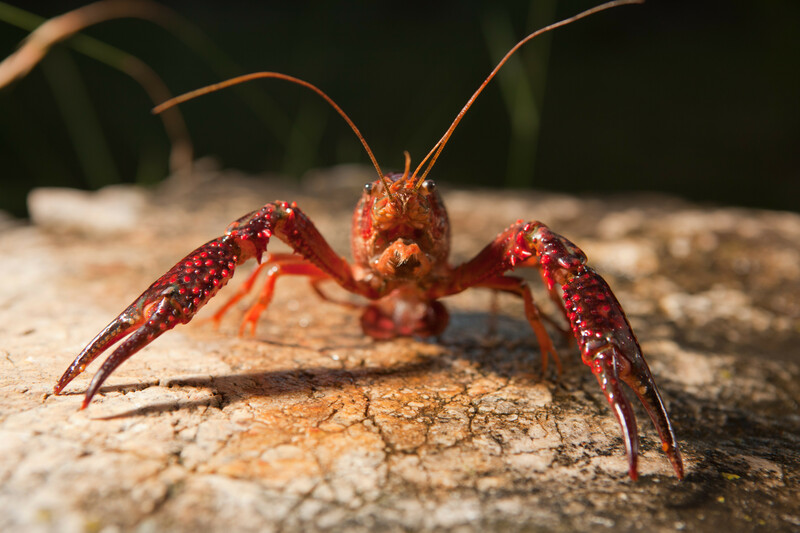 A popular aquaculture and bait species, this highly adaptable crayfish spells trouble outside its native range. Populations grow rapidly and their burrowing habit significantly alters new environments by changing habitat structure and increasing sedimentation. These changes can make it difficult for native species to compete and can even encourage other invaders that are more able to tolerate the newly disturbed conditions. Trapping is the most practical way of capturing crayfish, though netting can also be used. Crayfish resemble lobsters, but they are smaller and have narrower claws. Their flavor is similar, but crayfish meat is sweeter and more tender than lobster. They are opportunists when it comes to eating meat, so bait your traps with fish or chicken and you’ll be sure to attract dinner. The following recipes are courtesy of the Minnesota Sea Grant – Thank you! 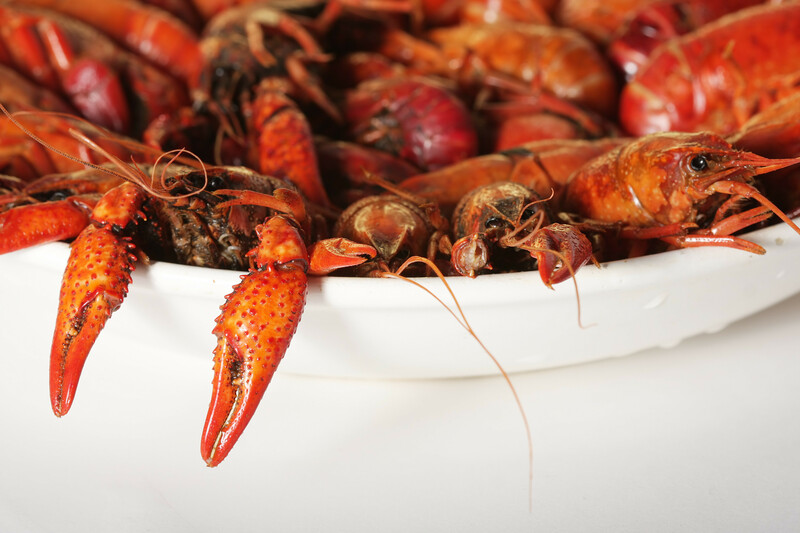 Visit ‘A Craving for Crayfish: Minnesota Discovers a Louisiana Tradition‘ for helpful hints on the nutritional value of Crayfish, and how to obtain, transport, freeze and prepare them. Enjoy! Crush mint leaves and garlic together until they are almost in a paste. Place in a jar with a tight-fitting lid. Pour hot water over the garlic-mint paste. Add salt and pepper, stir. Close lid tight and let stand for 5 minutes. Add olive oil and shake well to blend. Use as a dip for dunking boiled crawfish tails. The flavor blend grows steadily as you eat. This dip can also be used for marinating lamb or chicken. 3 to 4 pounds large crawfish tails, peeled and cleaned. Simmer cooked crawfish tails in well-salted water 10 to 12 minutes, until tender. Fill bowl with chopped ice and arrange tails over top. Provide toothpicks for handy dipping. Serve with cocktail sauce or serve in individual cocktail glasses for a meal. A good appetizer for receptions and parties. Brown flour in oil until a golden brown. Add onions. Stir constantly until onions are almost cooked. Add 1-½ cups cold water and simmer for ½ hour. 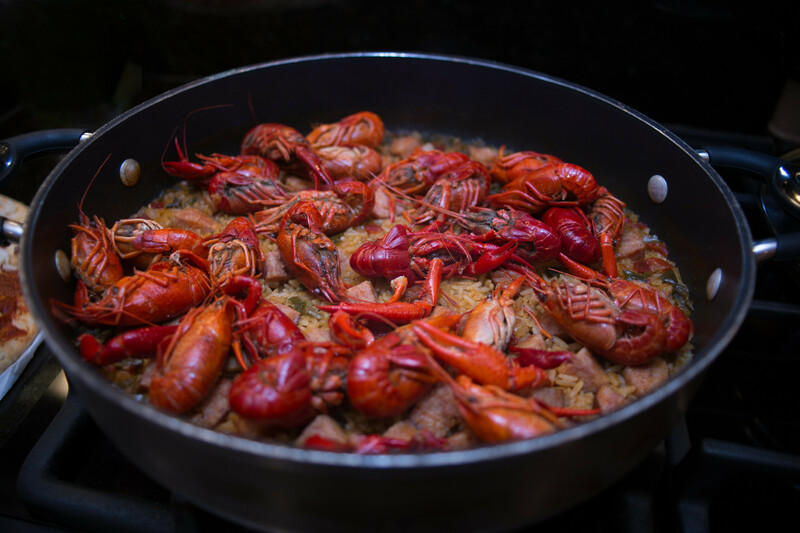 Add crawfish tails and fat; cook until crawfish turns pink. Add about 2 cups less 2 tablespoons water and bring to a boil. When water is rapidly boiling, add remainder of ingredients. Stir to blend and cook on low heat, covered for about ½ hour or until rice is tender. Five minutes before serving, using a 2 prong fork, fluff up jambalaya so rice will have a tendency to fall apart. Serves 4 to 5 people. A special thank you to author and ecologist Corinne Duncan for her content contributions to the Red Swamp Crayfish Introduction. Combine everything except peppers. Stuff into the peppers and chill. Melt butter in iron skillet or heavy pot. SautŽ onions, garlic, green pepper and celery until onions are clear. Add 1/8 cup water and simmer covered until vegetables are tender (about 15 minutes). Add crawfish and other seasonings. Cook 15 minutes. Add green onion tops and parsley and cook 5 minutes for seasoning to blend. Serve with hot steamed rice. Serves 4 to 5 people. In a bowl beat the egg, add the milk, prepared mustard, salt, pepper, and garlic powder. Mix well. In another bowl, sift the flour, cornmeal and baking powder together and stir well to blend ingredients. Dip the crawfish tails in the egg-milk mixture, one at a time. Let drain a little then dip in cornmeal-flour mixture. Put on a plate until you have enough to fry. Drop in deep hot fat (390-400¡F) and cook until golden brown. Drain on paper towels. Serve hot with catsup or tartar sauce. A Swedish way to prepare crayfish. Combine water, dill, salt and sugar in a very large pot. Cover and bring to a boil. Meanwhile, check crayfish, making sure that all are alive. Rinse under cold water. Drop crayfish into briskly boiling dill-water and cover at once. Bring to boil again and cook 7 minutes from the time the water starts boiling. Let cool in cooking water. Place in refrigerator overnight, still in water. When ready to serve, pour off cooking water and remove soggy dill. Arrange crayfish attractively on a large platter and garnish with crowns of fresh dill. Serve with hot buttered toast, Swedish spiced caraway cheese, and perhaps with well-chilled aquavit or beer. 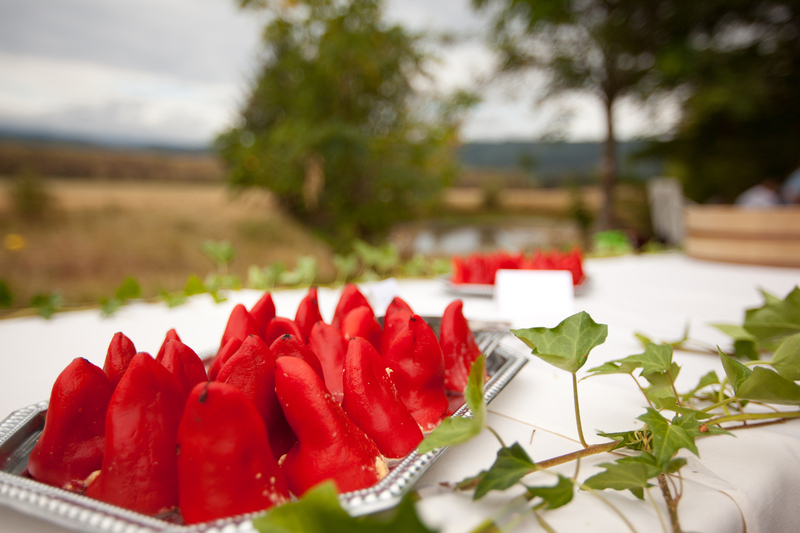 These, plus a lot of good cheer and songs are vital ingredients for a Swedish crayfish party. Serves 3 to 4 people. Boil for about 15 minutes to extract the flavors. Add 8 to 10 washed small red potatoes. Return to a boil. After 10 minutes, add 6 ears of sweet corn broken into thirds and the live crayfish. Return to boil and cook for 10 minutes. Crayfish will float to the top of the water when done. Turn off heat and let soak. The longer the soak, the spicier the flavor. Sample potatoes, corn, and crayfish to check flavor. Five minutes is a typical soak time. Remove crayfish, potatoes and corn from water, drain and serve. A basket that fits inside the pot will make removing and draining easier. Serves 4. To boil another batch in the same water, add more salt and red pepper and repeat the process. Water can be boiled outdoors over an open fire or indoors on the stove top.